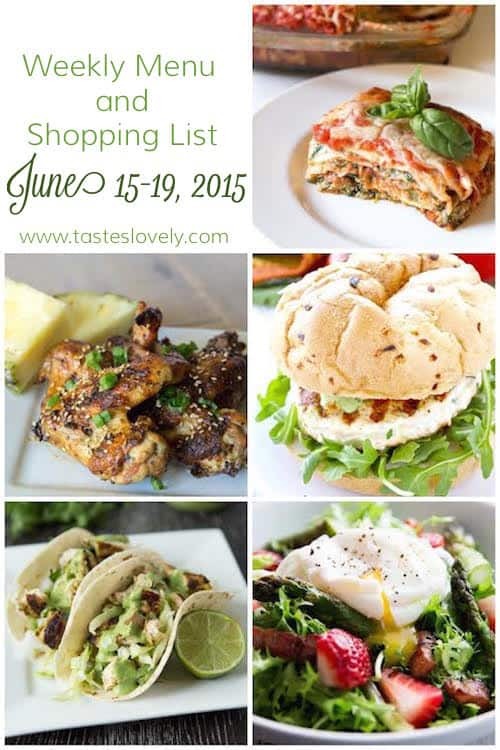 Weeknight dinner meal plan and grocery shopping list for the week of June 15-19, 2015. Garden Vegetable Lasagna and caesar salad // Delicious layers of spinach ricotta, sautéed zucchini & onion, noodles, marinara sauce and mozzarella cheese. This makes enough for 8 people, so you’ll have some great leftovers for lunches. Serve with a simple caesar salad (chopped romaine lettuce, parmesan cheese, and your favorite caesar dressing). Mustard Grilled Pineapple Chicken Wings and potato salad // Crispy grilled chicken wings that are marinated and coated in a mustard pineapple sauce. Served with a simple 4 ingredient potato salad. Salmon Burgers with Green Goddess Dressing served with crispy oven baked potato wedges // (This recipe comes from my blogging friend Keri at Fashionable Foods!) 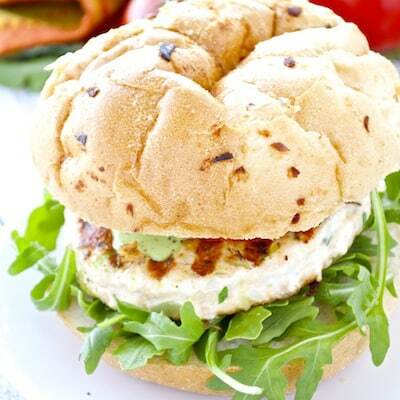 A light and healthy salmon burger topped with an herby green goddess dressing. Served with my favorite crispy baked potato wedges. Dip the potato wedges in any leftover green goddess dressing! Chicken Tacos with Cilantro Lime Ranch Dressing served with chips and salsa // Chicken tacos topped with a cool and zesty cilatro lime ranch dressing. Serve it with your favorite tortilla chips and store bought salsa. Asparagus, Bacon and Strawberry Salad with Poached Eggs served with crusty bread //(This recipe comes from my blogging friend Nora at Savory Nothings!) 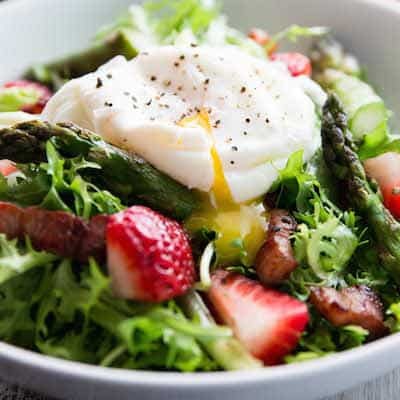 A sweet and savory salad topped with sautéed asparagus, crispy bacon, sweet strawberries and topped with a poached egg. Serve it with some crusty bread to soak up all the left over dressing. Make the lasanga, then cover in foil and refrigerate until ready to bake on Monday. Make the chicken wing marinade, and marinate the chicken wings until ready to grill on Tuesday. 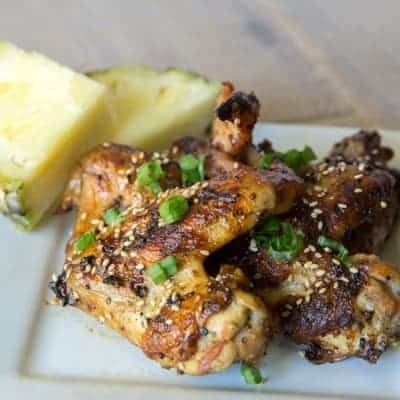 Make the pineapple glaze for the chicken wings, cover and refrigerate. Make the potato salad, cover and refrigerate. Make the salmon patties for the salmon burgers. Cover and refrigerate. Make the green goddess dressing for the salmon burgers. Cover and refrigerate. 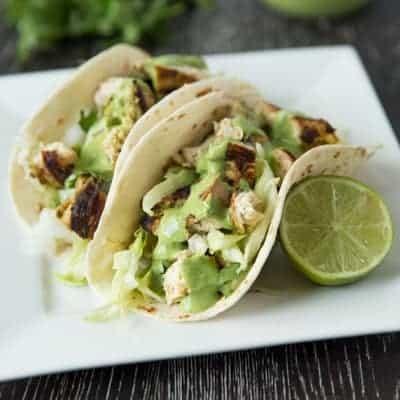 Make the cilantro lime ranch dressing for the chicken tacos. Cover and refrigerate. Make the salad dressing for the asparagus, bacon and strawberry salad. Cover and refrigerate. 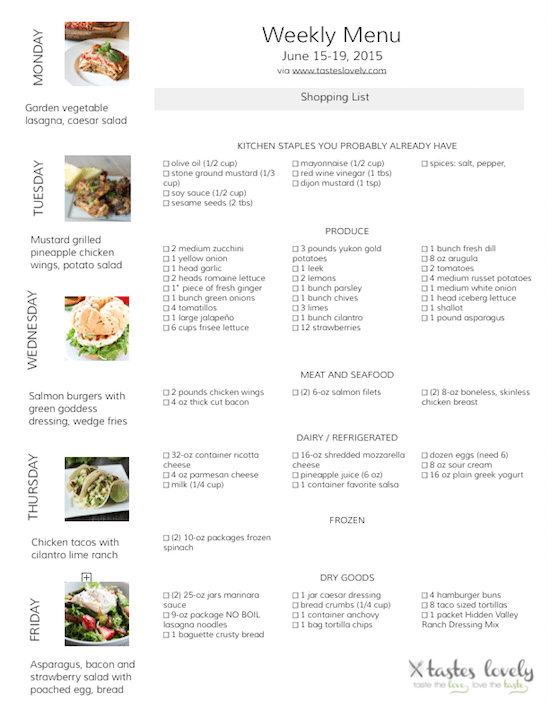 Another fabulous weeknight dinner meal plan. Love all of these suggestions Natalie. Such great ideas! I have had that Lasagna on my mind since you posted it!! Love this week’s menu. 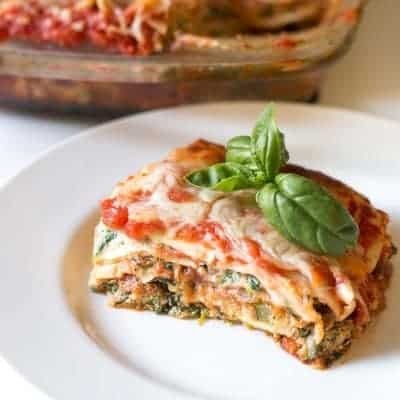 Your veggie lasagna sounds perfect for tonight! Love this! 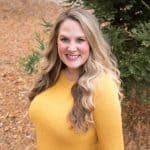 You already broke everything out on when to prep and what to buy! Such a great post! I’m especially loving that garden veggie lasagna – I need to get on the meatless monday train! Natalie, I seriously love your weekly meal plans!!!! oh how I would love to dive into your Garden Vegetable Lasagna right now!!!! ARGH . . I’ll be making this next month for sure!!! This all looks amazing! I’m especially into the veggie lasagna. Yum!